It goes without saying that I am obsessed with the details. Truly, I drive myself crazy planning for the right light, the right location and the right tempo for my subjects on hand. So when we finally wrapped our epic, 4 hour shoot with some cold, fresh cider and cinnamon doughnuts from this super quaint orchard nestled in the Blue Ridge Mountains, I had as much synergy to get to the edits as I did in our planning of the day's locations. Though in editing these photo gems, I had to curb my own OCD in time to share this engagement shoot set whilst the apples are still on the trees! I've known the lovely Jane Kramer for many years but had yet to have the wonderful occasion to photograph Western North Carolina's favorite song bird. And this fiancé of hers, just let me tell you ...if you don't already know the unofficial mayor of Asheville, Jason is the real deal; genuine and funny, kind and cool. The two of them together make honestly sweet and a too-irresistible-to not-photograph kinda love! With all these crazy good intentions, why wouldn't we plan for the sweetest, surprise serenade next to the Golden Delicious + Galas? 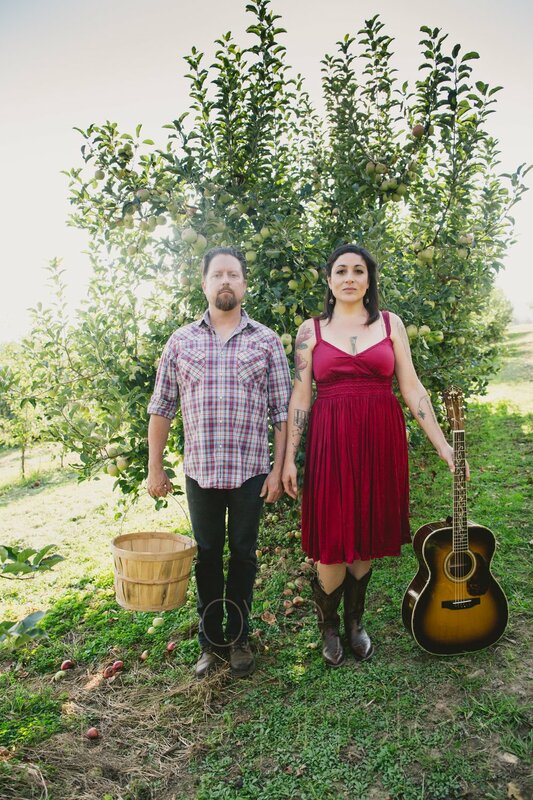 Along with Jane's willingness and charming, sweet vocals, we had the perfect photo op set up when Jason returned from searching out a ladder to climb to the top of the tiny, but full of fruit trees! He fell perfectly into our photo plan....and in love with this good and kind song bird. Just look at the way he looks at her as she sings to him. 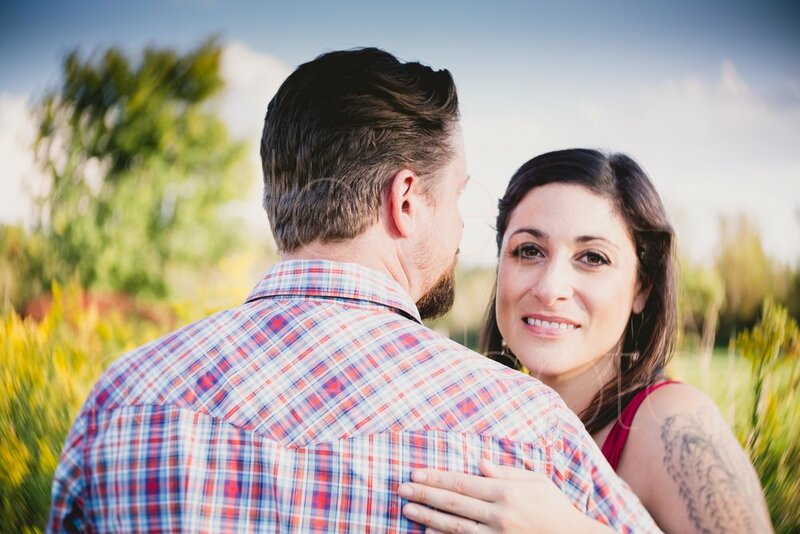 **Warning: I'm a gushy, love loving kind of wedding photographer so you know the e-shoot is going to be something of an appetizer to their actual wedding day photos. Stay tuned and scroll down for more if you love the love, too! Of course, no Rose Photo Custom Engagement Shoot is started without a proper toast. Before we headed out towards Bat Cave in search of bushels of apples, we filled a couple pints down at The Wedge in the River Arts District. Good old Sammie Dog made her cameo and any photo jitters where washed way with a cold one! Planning for a picture perfect engagement shoot really has everything to do with the couple, their story and how we can best tell that story with our lens. Including Jane + Jason's favorite four legged, learning where they love to toast to the weekend and finding the best locations as backdrops to tie it all together is my favorite obsession. Afterall, I never have the same 'day at the office' twice! To Jane + Jason, so much love to yous for including me in your big day vision and trusting my photo ninja skills in the bushes! I cannot wait for October 14 in Mars Hill to capture more of your love story and make even more photos of my dreams with you two as subject.